73,21 € 73.21 tax incl. You will surely be amazed at the type KEIHIN PWK us ... It is not too kind to the house of habit, however here, the product is really quality and had quite a place here. We obviously do not go to say that this product is manufactured in KEIHIN and even less that it is identical to the true KEIHIN, like any copies it made ​​in Asian countries, but the quality is really present unlike many copies we'll explain and demonstrate throughout the description and photos. First base, we were amazed at the finish has made ​​this piece, but also amazed at the quality of aluminum or even hardware. Whether side machining / mold or assembly, the finish is really perfect. 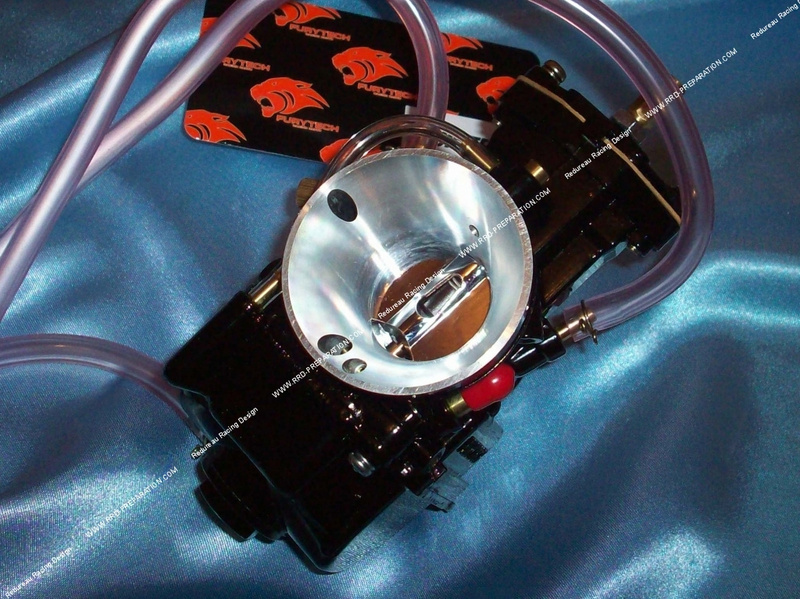 The entrance to the carburetor is well studied by the venturi phenomenon, this entry is machined in the rules of art, it is a diameter of 55mm. The body is machined very cleanly throughout. The pipe side mounting diameter is 40mm (thus pose with a sleeve of interior Ø40mm or a female pipe flexible internal Ø40mm). Bushel is chromed aluminum side very well finished pipe as it were perfect, a slight lack of air filter side finishing a barely perceptible to the eye ... the power jet entered is true with power jet nozzle, so it is adjustable and very active. The nozzle without problems be able to change by simply removing the cap on the tank! To remove the tank, only 2 single Phillips-head screw. Below is a simple jet like Keihin hexagonal. With a diameter of 30mm, its presets, his power jet and its flat bushel he will agree to the engines very equipped especially those with a cylinder with exhaust has bar. For main jets we recommend the POLINI . As a measure, spare parts and settings come to the site.